Two hundred guests, among them Illinois Governor Pat Quinn, members of the Chicago Consular Corps and leaders in the Polish-American and Jewish American communities met Thursday, April 24, 2014 at the Polish Consulate in Chicago to honor the memory of Jan Karski on the centennial of his birth. The commemoration at the Polish Consulate in Chicago was also attended by Holocaust survivors, Righteous Among the Nations, participants in the Warsaw Uprising 1944, Home Army veterans and Polish Siberian Exiles. The commemorative program was titled “Jan Karski – the History, the Legacy and the Responsibility”. The commemoration was organized by the Consulate General of Poland in Chicago with honorary partnership of the Jan Karski Educational Foundation Chicago, the American Jewish Committee Chicago and the Jewish United Fund/Jewish Federation of Metropolitan Chicago. The ceremony was held on the “Jan Karski Day in the State of Illinois”, proclaimed by Governor Pat Quinn. During the program guests saw a short film with Jan Karski’s testimony, titled “The World Knew” prepared by the Polish History Museum and Poland’s Foreign Ministry. Guests also had a chance to view the Polish History Museum’s exhibit entitled “The World Knew”, which will soon open at the Illinois Holocaust Museum and Education Center in Skokie beginning September 17, 2014. Jan Karski was a Polish diplomat and officer of the Polish Secret State during WWII. He was the first one to provide eye-witness accounts of the Holocaust to the Free World. It was through his words that occupied Poland alarmed the world about the German Nazi extermination of Jews. Jan Karski published ‘Story of a Secret State’, one of the most poignant and inspiring accounts of his experiences and efforts to stop the Holocaust. After the war, Jan Karski emigrated to the United States and earned a Ph.D. at Georgetown University, becoming a professor at Georgetown’s School of Foreign Service. For his bravery and stance against the German Nazi evil, President Barack Obama posthumously awarded Jan Karski the Presidential Medal of Freedom, the U.S. highest civilian honor. For his efforts to save Jews, the State of Israel awarded Jan Karski the Yad Vashem medal of Righteous Among the Nations. Jan Karski died in 2000. Photos and videos from the commemoration of Jan Karski’s centennial of birth on April 24, 2014 can be viewed on the Consulate’s facebook page (link below). A representative from the Consulate General of the Republic of Poland will be in St. Louis on Saturday, 17 May 2014 to accept applications for new passports, including renewal, replacement and to answer any questions regarding passports. Application for passports must be made in person and normally this would require travel to Chicago. However, the visit to St. Louis by a representative from the Consulate General will eliminate the need to travel to Chicago for those applicants taking advantage of this arrangement. All applicants for passports must register in order to allow our Consulate General in Chicago to qualify the data required for passport application and to schedule an appointment time on 13 April. Kindly call Consul Jacek Bryniak at (312) 337-8166 ext. 228 for the registration and to schedule an appointment.  Only a Polish citizen may apply for a Polish passport. Also, if your previous passport was issued before 13 April 1993, confirmation of citizenship will necessary. Whether applying for, or confirming Polish citizenship, contact Consul Eriusz Rybacki at (312) 337-8166 ext. 207 or chicago.passport-visa@msz.gov.pl as application for passport will not be accepted until citizenship is confirmed.  A Polish passport may not be issued without a PESEL number. If you do not have a PESEL number or you are not sure whether or not you have one, contact Consul Jacek Bryniak at (312) 337-8166 ext. 228 or chicago.passport-visa@msz.gov.pl.  If you are changing your name in the passport and do not have a Polish marriage certificate or Polish legal document confirming the change in name, contact Consul Jacek Bryniak at (312) 337-8166 ext. 228 or chicago.passport-visa@msz.gov.pl.  If applying for passport for a child under 18 years of age, both parents must consent in writing, both parents and the minor (over age 5) must be present.  Children born in the USA to parents with Polish citizenship must “register” the child’s American birth certificate in Poland before applying for their passport. Contact Consul Jacek Bryniak at (312) 337-8166 ext. 228 or chicago.passport-visa@msz.gov.pl for details. For your convenience, we will have a photographer available to provide approved passport photos. American Passport and Visa is the photographer and the charge for four (4) photos is $18 (check or cash accepted). Legendary Polish actress, Nina Andrycz, known as “the Great Dame of Polish theatre” because of her long and successful career, died on January 31 in Warsaw at the age of 101. The Polish audience remembers her mainly for her outstanding roles as queens, aristocrats, and noble ladies. She rose to fame after 1935 when she played on the stage of the Polski Theatre, where she took more than 100 roles including Maria Stuart, Lady Macbeth, Queen Elizabeth, Joan of Arc and Cleopatra. She was also a star of the Polish TV and Radio Theater. Andrycz was married to Józef Cyrankiewicz, the Prime Minister of communist Poland between 1947 and 1968. She appeared occassiionaly in films by top Polish film makers but it was the stage that she loved most. 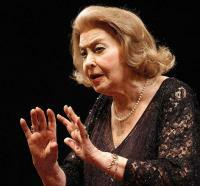 Her last appearance on stage was in 2011 at the age of 98. Her last movie was “Before Twilight” in the 2009.